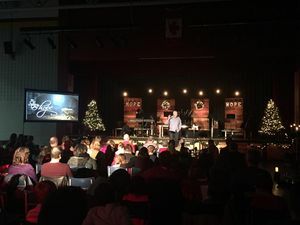 The Gathering Ottawa started in January 2006 at St. Jerome School in Riverside South in Ottawa, Ontario as a church plant of the Ontario Conference of Mennonite Brethren Churches. The congregation joined the conference in 2007. In 2017 the group met at St. Francis Xavier High School. The worship style was informal, with a worship band, sermon and sometimes discussion after the sermon. Members were also encouraged to be part of smaller groups called "Home Church." Kalmar, Laura. "Ontario conference looks towards the future." Mennonite Brethren Herald 46, no. 4 (April 2007): 16-17. "Our story." The Gathering Ottawa. 2017. Web. 23 February 2017. http://thegatheringottawa.com/about-the-gathering-ottawa/what-is-the-gathering/. Steiner, Sam. "Gathering Ottawa, The (Ottawa, Ontario, Canada)." Global Anabaptist Mennonite Encyclopedia Online. February 2017. Web. 21 Apr 2019. http://gameo.org/index.php?title=Gathering_Ottawa,_The_(Ottawa,_Ontario,_Canada)&oldid=147290. Steiner, Sam. (February 2017). Gathering Ottawa, The (Ottawa, Ontario, Canada). Global Anabaptist Mennonite Encyclopedia Online. Retrieved 21 April 2019, from http://gameo.org/index.php?title=Gathering_Ottawa,_The_(Ottawa,_Ontario,_Canada)&oldid=147290. This page was last modified on 23 February 2017, at 19:27.